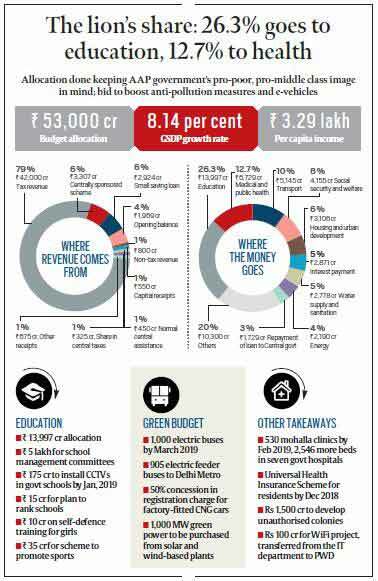 Allocation for two sectors highest in AAP govt’s ‘Green Budget’. Ahead of possible bypolls in the capital, the Aam Aadmi Party government used the Budget to reinforce its pro-poor and pro-middle class image, dedicating the lion’s share to education and health, and stressing on the benefits people would reap from subsidies in power and water sectors. The government also tried to signal its commitment towards anti-pollution initiatives by clubbing a clutch of measures under the ‘Green Budget’ category. According to an analysis by the PRS legislative research, Delhi’s allocation of 26.3% in education was higher than the average expenditure allocated to education by 18 other states. The allocation of 12.7% on health was also higher than the average expenditure of 18 other states. The government doubled funding for infrastructure development — from Rs 840 crore to Rs 1,500 crore — in unauthorised colonies, which form a sizeable vote bank. It also decided to fix timelines for projects and services, and made them a part of the Budget document, marking another first after the ‘Outcome Budget’ initiative started last year. “We would ask the chief secretary to apprise the Cabinet during weekly meetings the reasons behind delays in projects. We want people and the media to hold us accountable. Hum chahte hai ye humare gale ki haddi ban jaayein,” Chief Minister Arvind Kejriwal said. Sisodia said the government will clear arrears of DTC employees due to implementation of the 7th pay commission. He frequently invoked the Lt-Governor, suggesting that objections made by him to the government’s proposals will trigger confrontation. Sisodia began his speech by describing the economic philosophy of the AAP government as “trickle up”, as opposed to the trickle down economics “being followed in the country since the liberalisation of 1991”. “What’s the point in being the fastest growing economy when our kids remain malnourished? What’s the point in holding mega investor summits when we don’t invest money in education and health?” he said.